We went to check out ET's first football game of the season tonight. Normally, I would not be interested in attending a game that didn't involve my own child - but the weather was so nice out today, that I said, "What the heck" and we showed up to root on his debut of Quarterback for his team. He was a little Tom Brady out there. You could tell he thought he was hot stuff too. It was crackin' me up. But, I have to say, I was really impressed with ow well he did. Completed passes, threw some balls that resulted in touchdowns. Great game. Then we went to Taco Diner to eat dinner with Cenote, Venus, ET and the Carter family. We put the kids at the bar and the adults got a table. I've decided that's the best course of action for all future meals. For some reason, they act better when they aren't sitting with us. And it's ever so much more pleasant to not have them at our table. 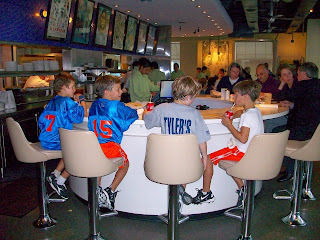 The boys thought they were hot stuff getting to order their own meals. So, win-win all around. Came home, did Little Man's 30 minutes of reading, brushed teeth, in bed. Now, I'm off to watch America's Next Top Model. Brain, off.